CHICAGO – Dec. 4, 2018 –– Three record-setting players will decide the highest individual defensive honor in the FCS. Junior linebackers Zach Hall of Southeast Missouri and Dante Olson of Montana and senior defensive end Derick Roberson of Sam Houston State were invited on Tuesday to the announcement of the 2018 STATS FCS Buck Buchanan Award, which goes to the outstanding defensive player in college football’s Division I subdivision. The Buchanan, named for the Pro and College Football Hall-of-Famer and presented since 1995, will be handed out at the STATS FCS Awards Banquet and Presentation Jan. 4 in Frisco, Texas – on the eve of the national championship game. Dexter Coakley, Rashean Mathis, Jared Allen, Arthur Moats and Kyle Emanuel are among past winners who have gone on to the NFL. Olson, from Medford, Oregon, has recorded the season’s FCS single-game high with 24 tackles, finishing with a school-record 151 overall. His 13.7 tackles per game rank No. 1 nationally, and the All-Big Sky Conference first-team selection had 11 tackles for loss, six sacks, two interceptions, three pass breakups, five quarterback hurries and three forced fumbles in 11 games. He was also one tackle away from tying the UM single-game tackle record at Cal Poly, putting in 24 stops against the Mustangs, and totaled 10 tackles or more in nine of 11 games this year. Following the season, he earned both defensive MVP and team MVP honors at the Grizzlies’ annual team awards banquet. 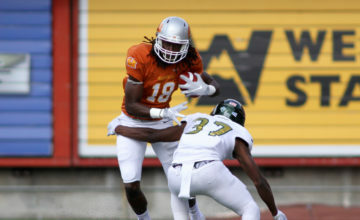 He was also the only Grizzly to earn first-team all-conference honors. Not only was Olson productive on the field this season, he carried a 3.87 GPA in the classroom as a business management major, spent free time volunteering as a mentor pen-pal with a group of underprivileged third graders in Northern California, encouraging them to pursue a college education. He is also an active member of his church. 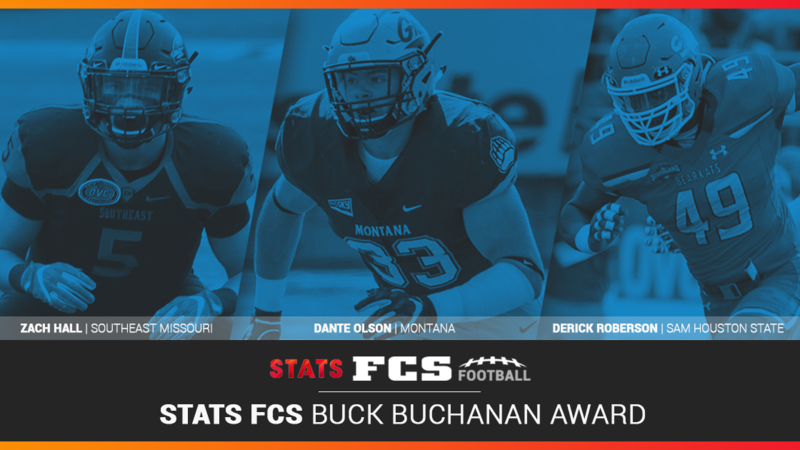 Montana has had 11 previous finalists for the Buck Buchanan Award since 2000, including two winners: Kroy Biermann (2007) and Tyrone Holmes (2015 – then called the STATS FCS Defensive Player of the Year). Olson’s single-season tackle total of 151 were just 26-shy of breaking the Big Sky Conference record of 176 set by Eastern Washington’s J.C. Sherritt in 2010, who the Buchanan Award that season for his efforts. However, Sherritt’s remarkable total included four playoff games during the Eagles’ run to the FCS national championship. In his 11 regular-season games, Sherritt accumulated 125 total tackles (64 solo, 61 assisted), as compared to Olson’s 218 total of 151 (57 solo, 94 assisted). Hall, from Louisville, set Southeast Missouri’s single-season record with 168 tackles – the most in the FCS – while his team earned its first playoff win and finished 9-4. 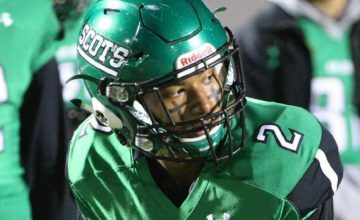 The Ohio Valley Conference defensive player of the year racked up 12 tackles for loss, two sacks, four interceptions, two pass breakups, two fumble recoveries, four forced fumbles, one blocked kick, one defensive touchdown and one safety. Roberson, from San Antonio, tied Sam Houston’s single-season record with 15 sacks, ranking second in the FCS with an average of 1.36 per game. 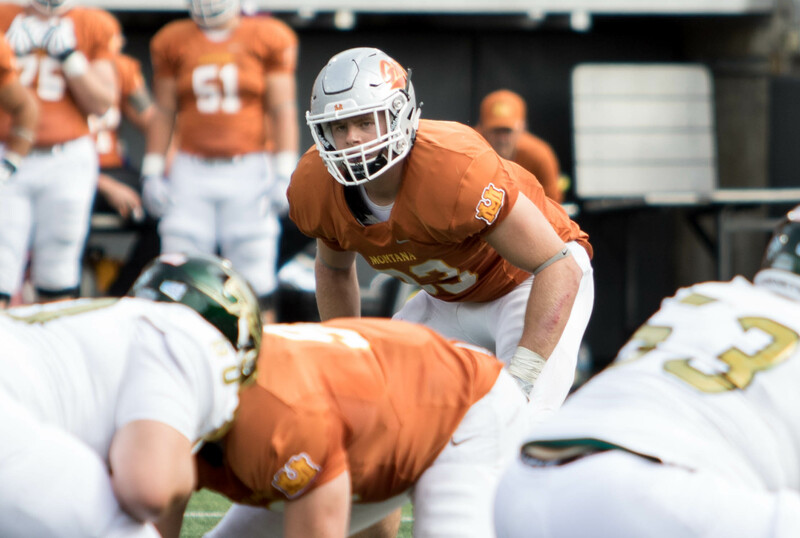 His five forced fumbles are tied for the second-most nationally, and the All-Southland Conference first-team selection had 68 tackles, 20.5 tackles for loss, two pass breakups, a blocked kick and a safety in 11 games. 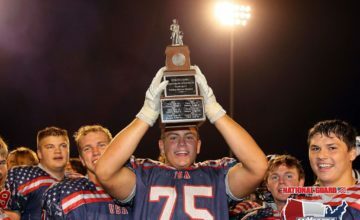 A national panel of 153 sports information and media relations directors, broadcasters, writers and other dignitaries voted on the Buck Buchanan Award following the regular season. Voters selected a Top 5 on their ballot.The FCS National Championship game is set for Saturday, Jan. 5 at Toyota Stadium in Frisco, Texas.